SAS has been through many restructuring programmes and capital raisings over a number of years. Yet it still has high unit costs and poor labour productivity, is loss-making and has a weak balance sheet. In 1QFY2013 (Nov-2012 to Jan-2013), the group's loss before tax and non-recurring items widened to SEK801 million from a SEK656 million (EUR78.7 million) loss a year earlier. Nevertheless, it continues to target a positive pre-tax result and an EBIT margin of more than 3% for FY2013. The Nordic region contains a more efficient long-haul operator (Finnair) and is experiencing increasing penetration by short-haul low-cost operators from elsewhere in Europe. Also, in Norwegian Air Shuttle, SAS has a low-cost local operator that competes with it on both short-haul and (from this summer) long-haul. In Nov-2012, CEO Rickard Gustafson called the ‘4Excellence Next Generation’ plan, which aims to achieve SEK3 billion (EUR360 million) of annual savings by 2015, a “final call if there is to be a SAS in the future”. The biggest carrier overall in the region, SAS is the number one carrier in its three Scandinavian home markets Sweden, Norway and Denmark and number two in the fourth Nordic market, Finland. With an average of 1,111 daily departures in Jan-2012 to Oct-2012, it also had the highest departure frequency in the region. In 2012, it opened 38 new routes, many to leisure destinations, and it plans 45 new routes for 2013. Scandinavian Airlines was the second most punctual airline in Europe in 2012, although in 1QFY2013 (Nov-2012 to Jan-2013), its 15 minute punctuality measure fell to 84.9% from 87.5% a year earlier (source: SAS). SAS has a history of aviation firsts. For example, it was the first airline to introduce Tourist Class (1952), in-flight entertainment (1968), separate check-in and lounges for business class passengers (1982), sleeper seats (1992), windows in business class toilets and biometric check-ins across a whole domestic market (Sweden, 2006). It recently became the first airline to achieve IATA’s Fast Travel Award Platinum status, by offering more than 80% of all its passengers the self-service options that make up the IATA Fast Travel programme. SAS is a member of the world’s largest airline alliance, the Star Alliance and this has enabled it to offer customers a significant global network through partner carriers. 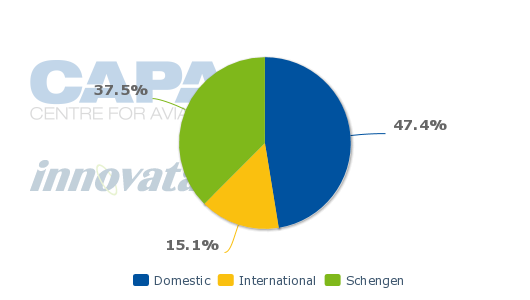 In Scandinavia, Europe and North America, Star Alliance partners receive more passengers from SAS than they feed it, whereas in South America, Africa and Asia the reverse is true. SAS’ unit costs (cost per ASK) are among the highest in Europe and, to a large extent, this reflects poor labour productivity. Labour accounted for one third of SAS Group revenues in the year to Nov-2012, the biggest cost category. Mainly as a result of its high cost base, SAS has been loss-making since 2008. *Financial year ends as follows: IAG, Iberia, BA, Air France-KLM, Finnair, Norwegian, Vueling Dec-2012; Lufthansa Dec-2011; Finnair Oct-2012; easyJet Sep-2012; Ryanair Mar-2012. In the 12 months to Jan-2013, the Scandinavian Airlines fleet had an average daily utilisation rate of 8.3 hours per day and the Widerøe fleet 6.8 hours. These figures compare with a European average of more than 10.5 hours per day (source: Airline Monitor). Although Scandinavian Airlines’ utilisation rates are climbing, they are now only just above where they were four years ago. Although it has been on an upward path, the load factor of Scandinavian Airlines (including Blue1) is below the AEA average. 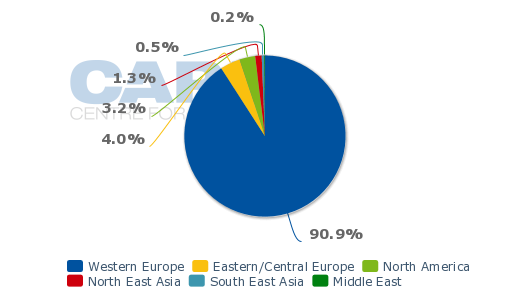 It reached 75.1% in calendar 2012, compared with the AEA average of 79.1%. To some extent, this reflects SAS’ shorter average sector length (1,099km in calendar 2012 vs AEA average of 2,347km). Indeed, AEA average load factors were 73.5% for international short and medium-haul in 2012, but LCCs such as Norwegian Air Shuttle and easyJet achieved load factors of 78.5% and 88.9% respectively in calendar 2012. SAS has an equity/assets ratio of 29% (at 31-Jan-2013) compared with its own target of more than 35%. It had SEK1,721 million (EUR206 million) of cash and cash equivalents at 31-Jan-2013, which is equivalent to only just over two weeks of revenues. Including unused credit facilities of SEK3,955 million (EUR474 million), its overall liquidity corresponded to SEK5,676 million (EUR681 million), or 20% of the group’s fixed costs at 31-Jan-2013. SAS’ own target is for this measure, referred to as financial preparedness, to be more than 20%. While SAS is just meeting its target, its financial preparedness stood at 33% a year earlier. Net debt was SEK7.8 billion (EUR936 million) at 31-Jan-2013, well below the SEK20 billion (EUR2.4 billion) peaks of the early 2000s, but on an upward path over the past two to three years. Accounting changes, to be applied by SAS from Nov-2013, will lead to a reduction in group equity. To mitigate this, SAS will transfer the majority of employees from the current defined benefit plan to a defined contribution plan, thereby not only reducing the impact on equity by an estimated SEK2.8 billion (EUR336 million), but also reducing defined benefit obligations by SEK19 billion (EUR2.2 billion) (58%). In addition to being in some ways an historic strength, SAS’ location in a geographically peripheral part of Europe is also a weakness in that Scandinavia lacks sufficient population to support an extensive long-haul network. Its network focuses mainly on domestic routes and on connecting its three Scandinavian home markets with each other and the rest of Europe. Long-haul accounts for less than 3% of its seat capacity. This has meant that SAS has lost traffic to larger European network carriers, as passengers often need to connect via other hubs for long-haul destinations, and to lower cost rivals in its core short-haul markets. All three Scandinavian countries have a stake in the shares of SAS: Sweden 21.4%, Denmark 14.3% and Norway 14.3%. Although they do not control the airline, some initiatives require the approval of the governments and/or parliaments of all three countries (a recent example being the provision of a new credit facility by the government shareholders). While all national carriers, regardless of ownership, are often under the public spotlight and the subject of political scrutiny, if not active interference, the presence of three governments on the SAS shareholders’ register increases this attention. SAS also often requires agreement from eight (of its many more) unions before moving ahead with some major initiatives. This can make decision-making cumbersome and slow, reducing its ability to react to changing circumstances. Moreover, SAS’ ownership structure has probably been a disincentive to potential acquirers of the airline, who would have to negotiate with all three states in addition to the owners of the publicly traded shares. The SAS Group has a cost reduction target of SEK3 billion (EUR360 million) by FY2015 through its ‘4Excellence Next Generation’ plan. This plan involves new collective bargaining agreements with flying crew and maintenance personnel (wage rates have been agreed and new schedules are to be implemented in 2Q2013), new pension scheme arrangements (to be implemented through 2013), the centralisation of administrative functions (81% of administration posts will be in Sweden in 2015, up from 49% in 2012), headcount reductions, outsourcing of ground handling and call centres and IT restructuring. Unit costs are on a downward path, falling by 22% from 2009 to 2012 and by a further 2.7% in 1Q2013. Labour costs’ share of revenues fell to 33.4% in 1Q2013 from 34.1% in 1Q2012. A change in SAS’ ownership structure, further reducing or eliminating government holdings could facilitate decision-making and encourage other potential owners to consider bidding for the group. In addition to cost saving targets, the ‘4Excellence Next Generation’ plan aims to achieve approximately SEK3 billion (EUR360 million) of increased liquidity from asset sales. SAS has initiated the process of selling its Norwegian regional subsidiary airline Widerøe and also aims to sell some of its airport-related real estate. It recently competed a sale and lease-back of 19 spare engines with an estimated market value of USD120 million. SAS has signed a letter of intent to outsource ground handling activities to Swissport and signed an agreement with Sykes for the outsourcing of call centres. Additional liquidity has also been provided through a new SEK3.5 billion (EUR420 million) revolving credit facility provided by banks and the three national shareholders. SAS has a fleet modernisation plan that is already well in progress. From 2014, its short/medium-haul fleet will consist of only one aircraft type for each of its three bases: A320 family (including A320NEO from 2016) at Copenhagen, and Boeing 737NG at Oslo and Stockholm. The plan will see all SAS’ MD80 and 737 Classics replaced by 2014 through leased aircraft – no capital expenditure is planned before 2016. Its long-haul fleet is already exclusively Airbus, with A330/340 aircraft. The rationalisation and modernisation of aircraft types should allow savings in terms of fleet maintenance, crew training and fuel efficiency. Over the past decade, the Nordic region, historically too geographically remote to attract significant competition from carriers based in other parts of Europe, has seen growing penetration by low-cost carriers such as Ryanair and easyJet. In addition, the ‘local’ player Norwegian Air Shuttle has taken a significant market share after re-inventing itself as an LCC. Ryanair plans a number of new routes this summer in SAS’ home countries (if not its hub airports) including services from Aarhus and Billund in Denmark; Gothenburg, Jönköping, Karlstad, Malmö, Skellefteå, Stockholm Skavsta, Stockholm Västerås and Växjö in Sweden; Haugesund, Oslo Rygge and Oslo Torp in Norway. easyJet plans new Copenhagen services to Rome and London Gatwick this summer. Norwegian continues to plan double-digit capacity growth and will launch a number of new routes to European destinations from Copenhagen this summer. Moreover, Norwegian is starting long-haul services in 2013 with routes from Oslo and Stockholm Arlanda to New York JFK and Bangkok. SAS operates from both Oslo and Stockholm to New York Newark and so Norwegian’s new service is a direct competitor. SAS operates to Bangkok from its Copenhagen hub and previous connecting traffic into this service from Norway and Sweden may be undermined by Norwegian’s direct flights from those two countries. Norwegian will continue to add long-haul routes in competition with SAS in subsequent years. As with any labour-intensive service industry, airlines are vulnerable to labour unrest, not only among their own staff, but also among key airport-based suppliers such as ATC, ground handling, security and ground transport. For SAS, labour costs are a higher percentage of total costs and employee costs per employee are higher than for any other significant European airline. Although its eight key unions have agreed to labour productivity improvement measures under the 4Excellence Next Generation plan, the extent of change required cannot be underestimated and any deterioration in industrial relations would be a serious threat to the turnaround plan. In an industry that remains highly sensitive to economic fortunes, all airlines are vulnerable to continued economic sluggishness. In addition, air travel, regardless of the carrier, is vulnerable to geopolitical events and natural phenomena such as earthquakes and volcanic ash disruption. The price of jet fuel, which accounts for more than one fifth of SAS’ costs, is highly volatile. This reflects not only the unpredictable price of crude oil, but also variations in the crack spread, or refinery premium. In addition, 31% of its costs, but only 7% of revenues, are in US dollars, making it vulnerable to a strengthening of the dollar against the Scandinavian currencies. Mr Gustafson is not overstating the case when he makes the "final call"
SAS is planning capacity growth of 5% to 6% in 2013, with a focus on new leisure routes, moving away from its traditional dependence on the corporate travel market. This is likely to be higher than traffic growth rates in Europe and comes at a time when LCCs such as Ryanair and Norwegian are also planning additional routes from the Nordic region. In spite of good progress with unit cost reduction, and the 4Excellence Next Generation plan to reduce costs further and improve liquidity, SAS’ low labour productivity and high unit costs will bring challenges in making this capacity growth profitable. Europe’s major legacy airline groups are concentrating on their own problems and seem unlikely to come to the rescue if SAS cannot effect its own turnaround. Mr Gustafson’s analysis that this is the final call for SAS would seem spot on. Finnair, SAS and Norwegian, The Nordic Three: is consolidation on the way?